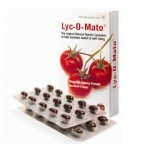 About Lyc-O-Mato®:Vita Healthcare (UK) Ltd are the authorised Distributor and Agent for. They bring unique natural health and beauty products of the highest quality and value to the UK market. Lyc-O-Mato® has been on the market for more than 15 years and is by far the UK’s best-selling brand of natural tomato lycopène. Lyc-O-Mato® tomato lycopene complex is a unique LycoRed product. This all-natural extract of lycopene-rich tomatoes provides a full complement of tomato carotenoids and other antioxidants to benefit good health. Lyc-O-Mato® is called a tomato lycopene complex because it contains a whole complex of phytonutrients including phytoene, phytofluene, beta-carotene, tocopherols and phytosterols. Scientific research has shown that the phytonutrient complex works in synergy with the natural lycopene resulting in more powerful antioxidant activity and greater health benefits. Lycopene is found in a variety of fruits and vegetables, but most of the lycopene in our diet comes from processed tomatoes and not the raw fruit. Key point: research suggests that lycopene improves prostate immunity.